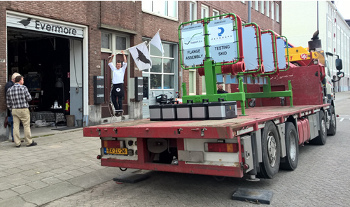 Training skid of Dijkgraaf-Suport is being unloaded at the User Day site. We have received very positive feedback and will have more of these User Days in the future. We thank all participants and especially thank Peter Dijkgraaf and Cyril Wentzel for their excellent contribution. 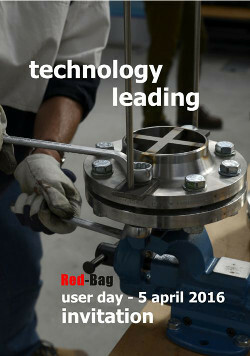 Red-Bag is conducting a user day on April 5, 2016 in Rotterdam. The registration is open for users of the Red-Bag software. The registration is closed, 2016. The main purpose is to meet other colleagues and to share experience. Design and engineering requires hands-on experience. The engineering calculations are difficult to assess without this experience. Although Red-Bag is a software company we believed this experience is crucial to giving adequate support to our customers. Red-Bag is finalizing the calculation software as per EN1591-2014. This calculation method is very detailed and complex. The Red-Bag software engineers together with engineers of Gasunie followed the course of flange management at Dijkgraaf-Support B.V. The images give an overview of the practical exercises supporting the theory as presented in the class room. Fluor Netherlands is using the PCC software of Red-Bag for the calculation of their pipe class components. During the years Fluor has provided valuable feedback for the further development of the software and the cooperation has been successful ever since. We are happy to announce that Bureau Veritas in Antwerp Belgium has placed the purchase order for the Red-Bag PCC and VES software. At Red-Bag we regard this order as an important milestone that signifies the confidence that a Notified Body has in the PCC, VES software and Red-Bag as a company.